We all love watching YouTube videos, but not all of us have good internet connections and hence it takes a lot of time to buffer. But, don’t you worry! 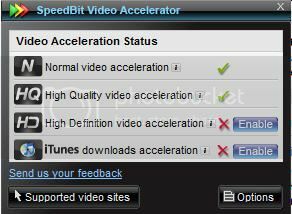 There’s a small tool known as SpeedBit Video Accelerator. SpeedBit Video Accelerator can buffer YouTube videos faster and thereby minimize video interruptions. Additionally, the SpeedBit Video Accelerator also allows you to search for videos. You can also bookmark favorite videos. Apart from buffering YouTube videos faster, it also supports faster streaming of videos on Metacafe, etc.